Last night, I had the honor to present opening remarks at the portrait unveiling of the Honorable William J. Mazzola. He has served as a Court of Common Pleas Judge in the First Judicial District of Pennsylvania for 31 years. My late father, Richard. F. Furia, Esq., presented the opening remarks at the Judge’s swearing-in in 1981 when I was just a pre-teen. While I won’t repeat my speech, there are a few things that struck me as important to share with our blog readers. First is the importance of the judiciary in America. Having served as a law clerk for several years, I got to witness first-hand the dedication, desire, determination and impartiality it takes to sit effectively on the bench. The ability to weigh facts and evidence, follow the letter of the law, take nothing personally, ignore public opinion and preside over a fair trial in order to effectuate justice is daunting. Yet, last night, every person who spoke about Judge Mazzola said that this is exactly what he has done for 31 years. He was serenaded, as you will, by President Judge Pamela Pryor Dembe and Judges C. Darnell Jones, Eugene E.J. Maier, Benjamin Lerner and Marlene Lachman. His praises were further sung by The Justinian Society Chancellor, Annette Ferrara, Philadelphia Councilman Dennis O’Brien, and attorneys Michael E. Wallace and Jay Gotleib. Everyone commented about the Judge’s sense of fairness, and ability to command a room, take charge and get things done. We all agreed that Judge Mazzola has served our legal community well throughout the years so it was our honor to present a visual legacy of His Honor to the Court. Another truth that was reinforced for me last night is the collegiality of the bench and bar in Philadelphia. While Philadelphia is considered a large metropolitan city, our legal community is quite small. We’re all just one degree of separation away from the other. Last night, the Judge and his adoring family were surrounded by attorneys and judges with whom they have worked and socialized for more than three decades. Attorneys, paralegal and secretaries from Stack & Gallagher, where the judge worked in his early days in the office next to my father, were there in numbers. Former A.D.A.s who worked with the Judge came to celebrate his accomplishments. And of note, more than 20 judges attended the portrait unveiling to wish their colleague well. Finally, as I walked the long, column-adorned corridors of City Hall on my way to the ceremonial court room on the sixth floor, I was reminded of the majesty and spender of the century-old home of Philadelphia’s government and judiciary. City Hall is the nation’s largest municipal building (larger than the U.S. Capitol). It is situated in the exact geographical center of William Penn's original 1682 plans for the city. The building is a unique architectural and sculptural triumph including more than 700 rooms and 250 architectural relief’s and freestanding sculptures, including its most famous 37-foot bronze statue of William Penn which stands atop the clock tower. Like Judge Mazzola with his father, Donato, I too walked the corridors hand-in-hand with my father as a young girl. Dad spoke of the majesty of the building and the hard-work of the people within it. He taught me to have a love of the law and respect for those who administer it. 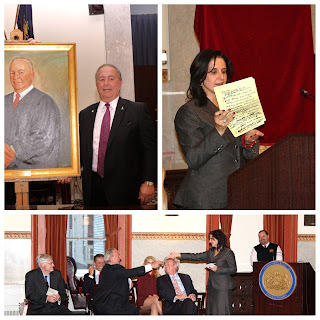 And he always told me that everything in life comes full circle – and so it did at Judge Mazzola’s portrait unveiling.